The action in KISS is inspired by the rock band with the same name. The game, created with an official license, is designed by WMS. The rock inspired graphics aren’t the only ones to draw attention to the slot, as that role is mainly undertaken by the two sets of reels of different sizes, one normal, the other a so called Colossal set. There are a lot of paylines in the slot, using the two game areas, and the same configuration was also used in a number of other online slots. 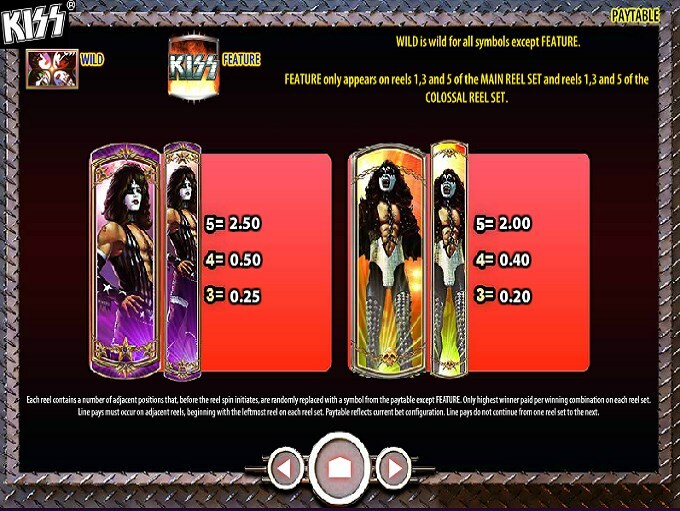 Featuring 5 reels on each of the two slots it has, KISS comes with a total of 100 paylines. The prizes are on the low side, reaching $1,250, while features bring you bonus games, free spins, scatter symbols, wilds and various regular stacked icons. The game offers the usual set of features, meaning that there are wilds inside, along with scatters and a chance to get either free spins or some kind of bonus games going. The slot’s reels are unusual, and they come in two variants. The set of reels on the left has a 5×4 configuration, with 5 columns of 4 symbols each. The one on the right, called the Colossal set, has 5 reels of 12 symbols each. The game makes heavy use of stacked symbols, so you’re not going to get wins as often as you might think, but when they do trigger you will have a lot of them at the same time. We have the four members of the KISS band together in the same symbol, in the one that acts as the wild. This symbol can substitute for others, but only if they’re not scatters. You’re not going to get prizes directly from the wild, and it will not apply a multiplier, so I’m not terribly impressed with it all things considered. 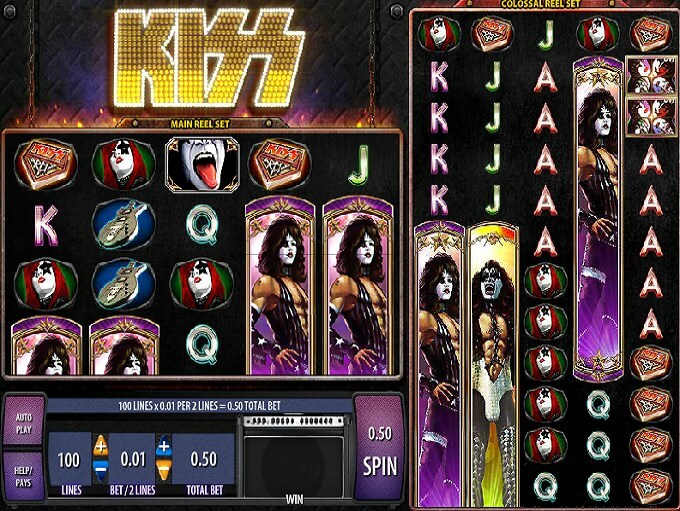 The KISS Logo is the feature icon, the scatter of the game. Both sets of reels can get this symbol on the 1st, 3rd and 5th columns. When this scatter appears on all three reels of the same slot machine, you get a choice of backstage passes. You can get the free spins, the band prize or a picking feature. If you get the free spins, you’re going to discover that they come with expanding wilds on the regular set of reels. The wild also transfers to the colossal reel as well when it appears on the regular reels. The wins from the free spins should be a lot better than those in the base game as a result. 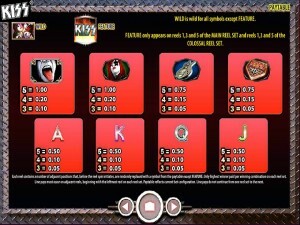 This is a bonus game, which allows you to choose from the guitar picks shown to you. You do this until the speakers are blown. Up to that point you collect all the wins you are given for your choices. Despite the 100 lines used, the game doesn’t need more than 50 coins to get them all active for the next round. One coin for two lines is what they call it, and it’s something I enjoyed seeing. Those coins have top values of $5, meaning that you can spend $250 on a single round of the game. Get a combo formed where the main symbol contributes, and you can expect 250 coins from each payline that is occupied by five of them. These being stacked icons, more often than not you’re going to get multiple prizes at the same time. The cash value is $1,250. The KISS band is known for the elaborate make-ups they wore, and that’s how they appear in the symbols of this slot as well. They are dressed in leather, with lots of hair and with their faces covered in white make-up. The game looks inspired by rock and roll, with plenty of metal, musical instruments and the black color being used wherever possible. You have a small set of reels on the left, and a huge one on the right. 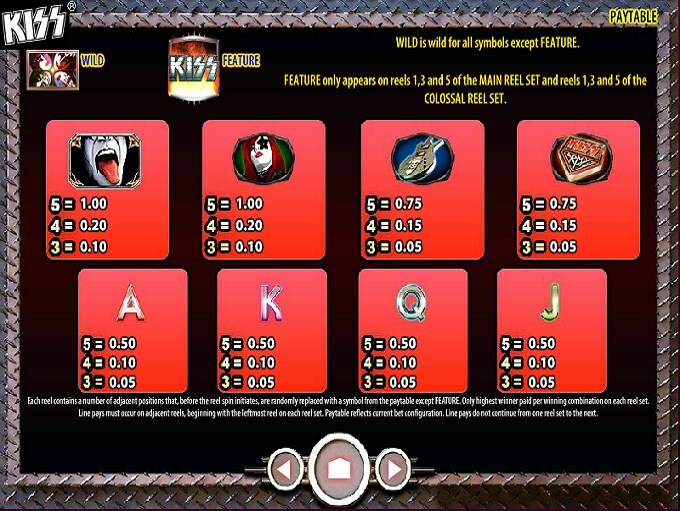 Symbols: KISS Band (wild), KISS Logo (scatter), Vocalist (250 coins), Guitarist (200 coins), Tongue (100 coins), Redhead Member (100 coins), Guitar (75 coins), KISS Guitar Pick (75 coins), Ace (50 coins), King (50 coins), Queen (50 coins) and Jack (50 coins). The design of the game isn’t very inviting if you’re not a fan of the band or of rock in general. If you’re in that category, it’s an interesting game that I wouldn’t hesitate to recommend. KISS is the name of a band of hard rock, which is based in the United States and which goes back all the way to 1973. Its two initial founders were Gene Simmons and Paul Stanley. The band is easy to recognize, with its members wearing white paint on their faces and being dressed in distinctive stage outfits. They also tend to leave a lasting impression with their shows, with plenty of pyrotechnics being involved, along with drum kits that levitate, rockets shooting out, smoking guitars, spitting blood and breathing fire, among other things. They’ve been awarded a total of 30 gold albums until now and 40+ million albums were sold in the US alone. If you count the rest of the world as well, 100+ million sales of albums will tell you all you need to know about the number of fans they have. 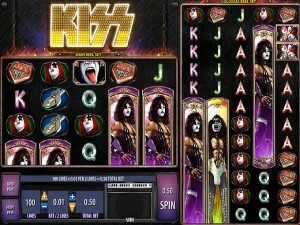 This KISS slot is offered by all online casinos with WMS software, playable either in practice or in real money mode.